On the late morning of August 14, 2014, I was looking for a rickshaw from Delhi's Majnu-Ka-Tilla to go to Vidhan Sabha Metro Station. I was on my way to meet my girlfriend's sister. After bargaining with few Rickshaw Walas (Peddlers), I sensed I may not get a single rickshaw. 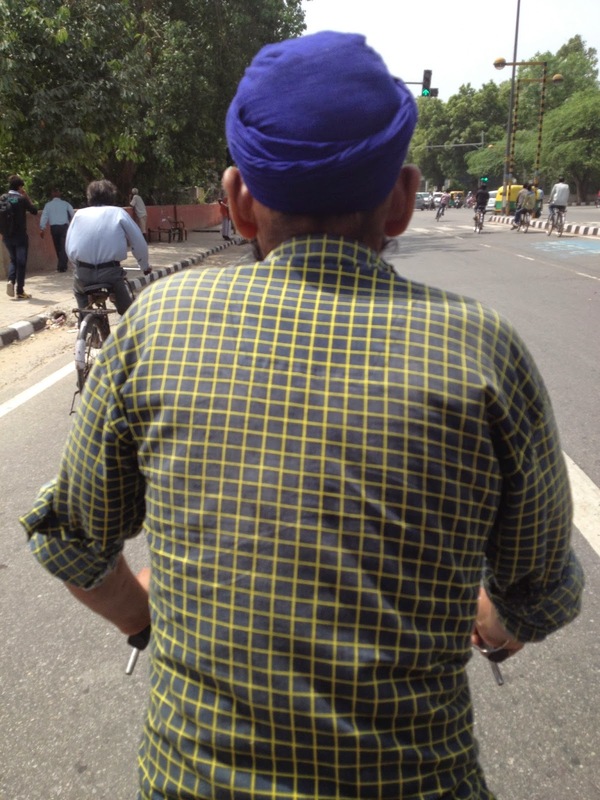 So, without bargaining any further, I stepped onto the next available rickshaw whose peddler seems to be in his 20s. As my heart slows down - after a risky 10 minute ride on the wrong side of the two lane highway - I saw several cuts on my peddler's two arms. He was wearing a long sleeve shirt but due to the heat, he rolled it up towards his ankle - baring these cut marks for anyone to see. Initially, I thought he may be into drugs. Then, I realized, with these many cuts, he won't be in a good shape to peddle this rickshaw - carrying me on an uphill road. So, out of curiosity (not knowing what will follow next), I asked him "App Kahan Se Ho Sadarji?" (Where are you from Sadarji?). I was expecting Punjab but he replied, "Mein Rajasthan Se Hoon" (I am from Rajasthan). Just to reconfirm, I asked, "Rajasthan?." He nodded his head. Then, I shot the next question, "Sadarji, Apke Hath Mein Kya Hua?" (What happened to these cuts on your arms?). He then immediately answered with a short note, "Yeh Saab Ladki Ke Chakar Mein Hua" (it's all because of a girl)." I was shocked and reacted, "Pyar?" (Love?). Now, I grew more interested in his love story. I asked, "Kya Hua Phir?" (What happened then?). He responded again with a short note, "Shaadi Ho Gaye" (Got married). On hearing this, with some big smiles on my face, I reacted, "Kya Baat Hai!!! App Toh Dewana Nikla" (Wow! You turn out to be a real lover." After a few seconds of silence, I asked, "App Ka Ladki Delhi Se Hai?" (Is your girl from Delhi?." He reacted, "Mere Gaon Se Hai" (from my village). On this I got little confused and threw another quick line to show my confusion, "Gaon Se?" (From your village?). Remember, he lives in Delhi. He finally threw his final line of clarification, "Uske Shaadi Kisi Se Ho Gayi" (She got married to someone else). On hearing this, my whole body started to feel numb. I was speechless. I thought, "How could a lady not love this guy?." At the same time, I feel sorry for him and his failed love. The Metro Station was just a few blocks away. I made my final move by asking, "Apke Shaadi Ho Gaya?" (Are you married?). As usual, he responded with one line, "Nahin" (No). 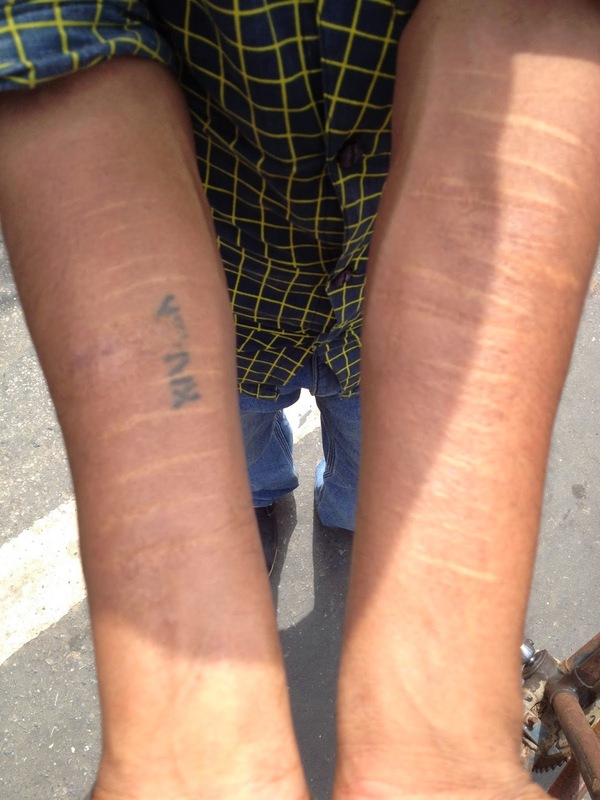 When I stepped down from the rickshaw, I sought his permission to take a picture of his cuts. I paid him a little more to make myself feel better. He responded with a gratitude "Dhanyawad" (Thank you). On my way down to the Metro Station, I thought he may have moved to Delhi to help himself get through this difficult love life. I just hope he finds a better women who love him as much as he love her. For the next few hours, I regretted my stereotype behavior - assuming anyone with cut marks on the arm as drug addicts. Never to have prejudgments on others...!